Register now for the CMAC Spring Banquet! The registration deadline is April 25. Register here. Crystal Mountain Alpine Club (CMAC) has been partnering with Crystal Mountain Resort from its inception in 1963. Since then, thousands of youth have come through the program to become lifelong talented all-mountain skiers, with some going on to race in college, on the US national team and even at the Olympics. CMAC’s philosophy is to provide programs that are fun and enjoyable for all participants while developing strong skiing skills learned through structured training and directed free skiing using the entire mountain. This creates strong racers and excellent skiers with a deep love of the sport. 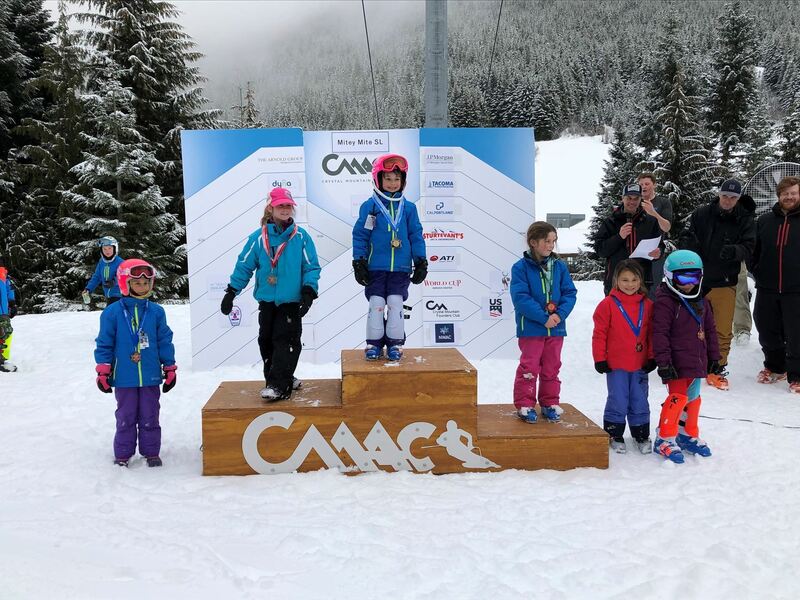 The CMAC philosophy not only develops successful ski racers, but skiers who will participate in the sport throughout their lives. This philosophy also develops life skills that transcend sports. 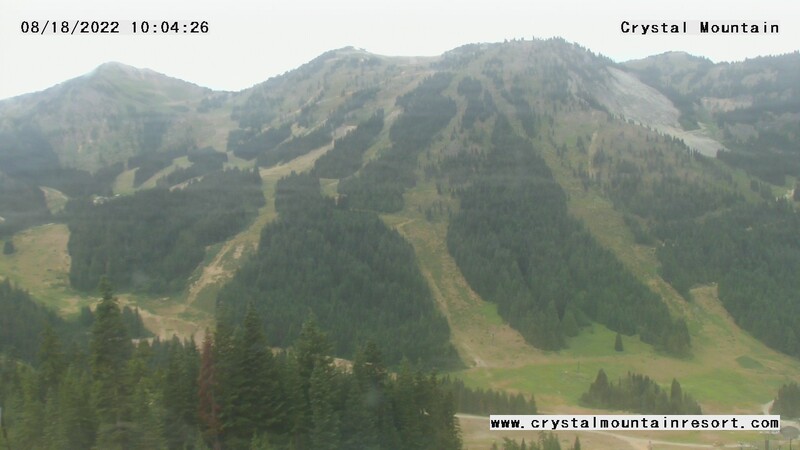 In collaboration with Crystal Mountain, CMAC hosts several races each season. As well as being great opportunities for the racers to compete and have fun, parent volunteers get to enjoy the ski racing community and learn more about the sport through these events. 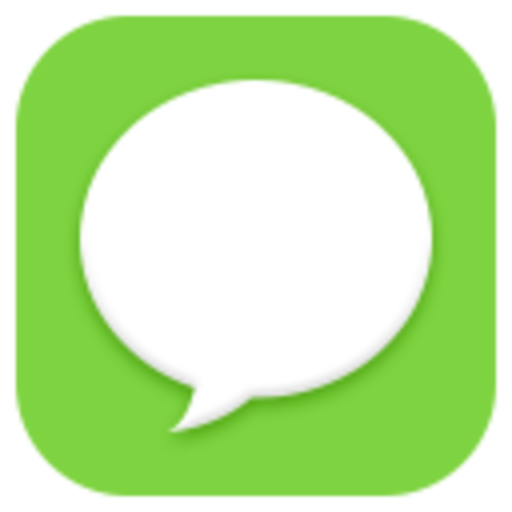 CMAC's FAQ (Frequently Asked Questions) has a tremendous amount of information for new and returning families. Equipment and clothing: lots of tips to be sure you've go the right gear. There you can find a link to the CMAC ski sizing guide. Volunteering is critical to putting on a ski race! Learn about volunteering at CMAC and get signed up ASAP. If you have any questions about CMAC, feel free to contact the Program Director Alan Lauba or the Program Administrator Dale Koetke. 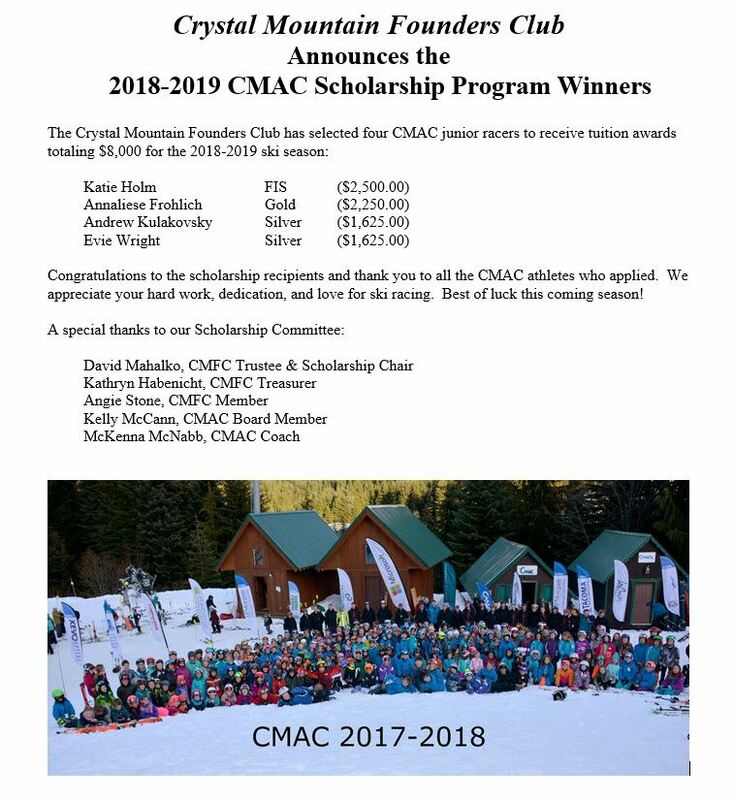 In support of our top student-athletes in CMAC, the Crystal Mountain Founders Club has dedicated $8,000 to the CMAC Scholarship Program for the upcoming 2019-2020 season. This year’s scholarship program is based on merit and CMFC will award up to four scholarships using performance based criteria. To learn more about this new program or to apply, click here. The deadline for applications is May 1, 2019. We're looking forward to a terrific season. Here are some thoughts about it from our board president, Andrew Stines. Subscribe to the CMAC Mail List. An archive of past mails is located here. To get the team communications specific to your athlete's program, be sure you add your email to their profile following these instructions. Register now for access to Sprongo training videos for the 2018-2019 season! CMAC is a member of the Pacific Northwest Ski Association division of US Ski and Snowboard. CMAC would like to extend a huge welcome and thank you to Tacoma Roofing and Waterproofing, our NEW Gold Level Sponsor! The beautiful roofs on the big new CMAC shacks are examples of their excellent work. Tacoma Roofing & Waterproofing’s architectural sheet metal division prides itself on quality and innovation to consistently meet or exceed our customers’ expectations. 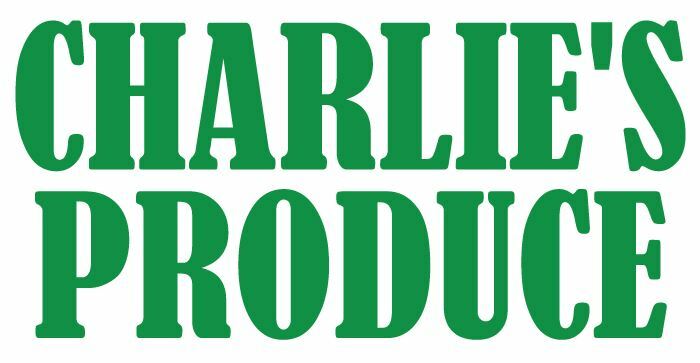 Our philosophy is to provide customer service, on-time delivery, quality craftsmanship and professional management, while offering competitive pricing in an ever-changing, competitive environment. Our goal is to remain a premier installer of custom sheet metal systems while keeping our commitment to excellence and dedication to meeting the needs of our employees. Tacoma Roofing & Waterproofing also has roofing and waterproofing divisions for commercial/industrial applications. All systems offered by TRW are certified and approved by roofing and waterproofing manufactures, therefore, TRW can offer 20-yr Full System Warranties. The systems we provide include vapor barriers, rigid insulation, cover boards and single-ply membranes. We also install silicone and urethane roof coatings, above-grade and below-grade waterproofing along with offering asphalt shingle and metal roofing panel systems. If you’re looking for a full system contractor, for your Washington or Oregon project, Tacoma Roofing & Waterproofing is that contractor. CMAC held a very successful qualifying event for our older racers. Thanks to the help from the many volunteers, we put on a high quality event! .All of the top kids from the NW attended the event and the overall winners of the weekend were Katie Holm from CMAC and Tyler Larson from SPAC. Thanks to the new snow making system we had really good coverage, and combined with some rain, a refreeze, and good grooming, we had a surface that was very firm. It was great for ski racing and quite difficult. Many thanks to Crystal Mountain for their efforts with the grooming and early lift loads for our race crew and coaches. Read the full report here and see race results here. n Schweitzer, our elite level speed skiers were tested with perfect snow conditions on a fun and fast course. Our two top girls Katie Holm and Evie Wright scored numerous top 20 results, and Katie finished off the week with a 3rd and 6th in SG which will qualify her for the Junior Nationals. Congrats Katie! Zach Derwin got his rookie start at a speed FIS event and had a ton of fun. Our FIS and U16 have had a spectacular weekend at Mt. Spokane. We had large move ups and strong effort across the board. Read the full race report here. 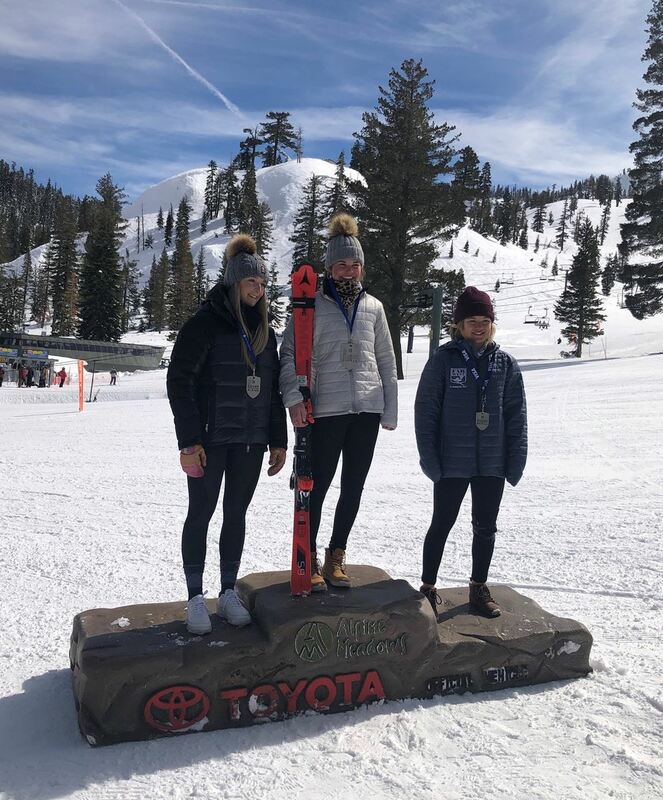 Our upper level skiers have been out on the race circuit a few times this season competing in the qualifiers for the Junior nationals. 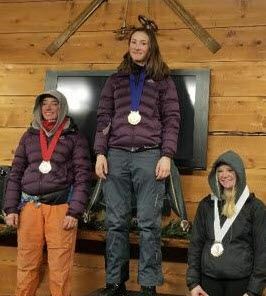 At the SL and GS qualifiers in Big Sky, Katie Holm, Evie Wright, Lewis White and Wyatt Kray competed in an Elite level FIS series. Katie led the way with some very good skiing starting from the 20’s moving into the top 15 in three races. 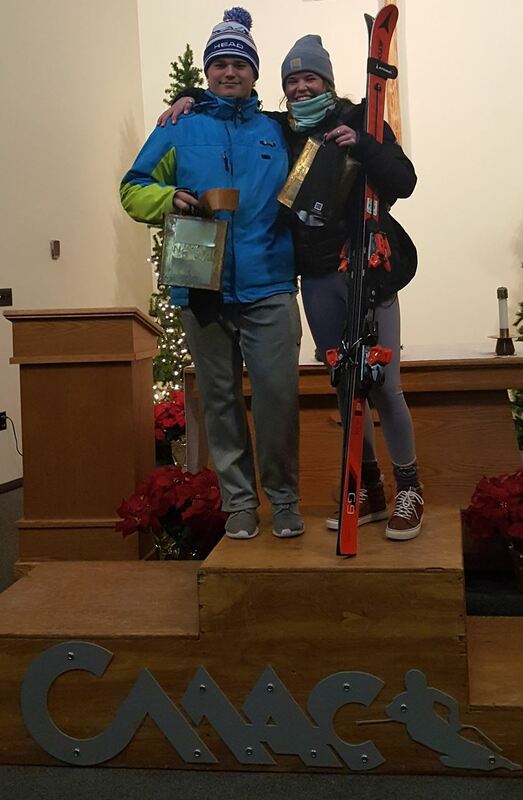 The rest of the group was attending their first Elite level series and it was quite a challenge, but all improved their skiing through the week. Becoming a great ski racer has lots of challenges and the pressure of competition really makes you push your limits to get better. I expect all of them to come back to show some new strength and perseverance in our NW Cup Series. Read more here. Here's a great video on avalanche safety. With all the recent snow, this is worth another review. Learn how your donations can support CMAC's Fund for Excellence. Blog News! Finally! Ski Pool, indexing, Weekly Wax Calls, etc. Join the CMAC Alumni Facebook group today! Registration for new families starts every year on October 1, with early registration discounts extending through October 15. You can learn more about CMAC through our extensive FAQ pages. To stay in touch, follow us on Facebook and join our email list. You can read recent newsletters, text messages and follow CMAC on Facebook! All CMAC Race Photos have been uploaded and ready to view and purchase here. Please feel free to contact Bret with any questions (360-663-2246, 253-732-6088 cell/text, or bret@vanostrom.com). Learn to take care of you gear the right way! Read John Ellis' Tuning Blog! SHOP AT AMAZON? Support CMAC! When you're shopping at Amazon, start from our AmazonSmile link. When you do, Amazon will donate 0.5% of your purchases to CMAC! Registration for returning athletes and their siblings opens September 1. 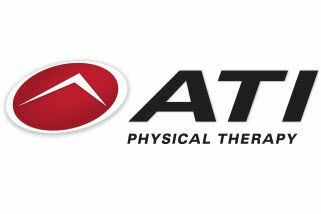 Registration for new athletes opens on October 1.
Review the programs and learn how to register. 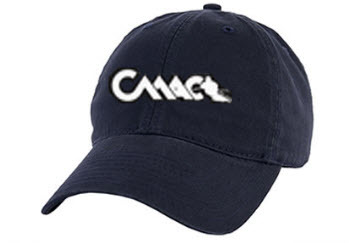 Order your hats, shirts and hoodies now for the upcoming season at the CMAC Store. All proceeds benefit CMAC's Fund for Excellence.